I purchased a sample of the Estee Lauder BB creme from Latest in Beauty for £1.50 (covers the cost of p&p), via text message last week and these are my thoughts after trying it out. Thankfully Latest in Beauty do take into consideration your beauty profile and they sent me the 02 Medium shade, which has a neutral-olive undertone. The BB actually stand for 'beauty benefit' rather than blemish balm, and it comes in a 5ml tube which I think would be sufficient for 3-4 uses. The creme itself smells fresh and reminds me of cucumbers, which I think fits in perfectly with the colour of the packaging. The BB creme is easy to use, I simply dotted around my face and used my fingers to blend in. The medium shade blended perfectly to match my skintone (I'm an NW35) and applied more like a tinted moisturiser than a foundation. 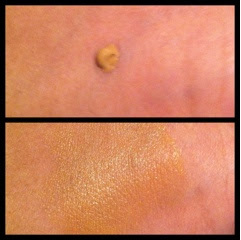 I did have to use a little mineral foundation on my T-zone as I prefer a matte finish, whereas the BB creme gives a more dewy finish (which you may prefer). 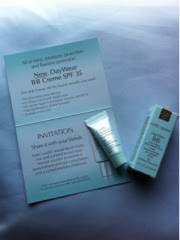 It also contains SPF 35 which is great as the weather seems to be brightening up. As someone who wears more mineral and powder foundations rather than liquid based ones, I was quite pleased with how it felt on the skin and didn't really notice that I was wearing foundation. The coverage is also light which I prefer for everyday wear, although next time I would apply concealer to cover any blemishes. oh wow this looks good. I recently got the L'Oreal bb cream and I don't think it looks as good as the Estee Lauder. Bring this to the swap please so I can have a look. Promise to swatch the tinniest bit!